If you plan to entertain throughout the summer, it is crucial to have ample seating options available. Now that we are finally in the height of summer, the weather is warm and ideal for enjoying your outdoor space. With this, your deck can easily become one of your best entertainment features for the summer months. Whether you want to invite guests over to enjoy a summer party on your deck, birthday parties, or even just a relaxing evening outside, your options are endless. 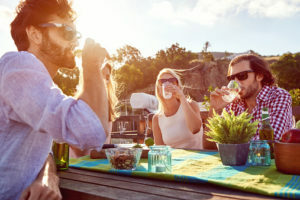 If you are ready to turn your outdoor space into a summer entertaining hotspot, trust the professionals at Mid-Atlantic Deck & Fence to guide you through summer entertaining must-haves for your outdoor space. If you plan to entertain throughout the summer, it is crucial to have ample seating options available. Turn your deck into a functional and exciting extension of your home entertainment space with a little creativity and great design. Features such as ledges for seating add practical function to your deck by providing you with reliable seating options beyond outdoor furniture. If you don’t want to modify your deck, consider accessorizing your space with a variety of outdoor furniture such as patio tables and chairs. Give your guests plenty of options for sitting, talking, and enjoying their meal with plenty of sitting space on your deck this summer. Summer decorations and accessories can both enhance your outdoor entertainment space as well as add to the overall curb appeal of your property if you plan to sell. Bright, colorful accessories such as unique flower pots, unique plants, or practical accessories can effortlessly liven up your space into a total summer entertainment area. Even lighting options such as lamps or string lights can add to the soft aesthetic of your deck as you entertain. Deck lighting, such as lights along the perimeter of your deck or steps, can also provide practical benefits for safely guiding guests around your space in the dark. A crucial aspect of an entertainment space is your ability to relax and have fun while enjoying your home. Not only is your deck a great place to host a party and enjoy the weather, but it is also a beautiful space for making memories with friends and family in any season. Create memorable days of fun with your guests throughout the summer months with a beautiful entertainment space by Mid Atlantic Deck and Fence today!